Vilnius was built in a forest, and trees hug its walls as it rises in their midst, red roofs painting a stretch of autumn foliage in the midst of the deep green. Forest ripples and stretches out on the horizon, rising slightly over the city level, as if nature is refusing to be outdone by man-made structures. The buildings don’t seem to mind. Lithuanians carry themselves like the inhabitants of a friendly wood; after all, they tell me, nothing in Lithuania is poisonous – except for maybe one snake, and even that won’t kill you. They emerge from the block-like cement buildings they live in, the last remnants of an old regime, and seem to rise like plants in the sun. On the walk from home to the bus stop, time is taken to taste leaves from the trees, to touch petals, to smell flowers. It is strange to me that someone thought to enclose these forest peoples in concrete boxes. I wonder that in summer they inhabit the indoors at all. There’s a spring of water behind my home, in a dip in the woods, so pure that you can drink straight from it. The banks are lined with wild strawberries and blueberries. Between the foliage I glimpse the bent backs of people harvesting wild mushrooms and other things – this plant tastes like garlic, this one is good for salads, this one helps with scarring. Sometimes, people wander barefoot; no plant dares to sting your feet in Lithuania. People seem to blend into the forest, like new flowers taking root where they were meant to stand all along. I take a taxi one night, at three in the morning. The streets are bare, the only movement the intermittent switch of a traffic light from green to yellow to red. On the corner, a grassy hill surrounded by a semi-circle of trees, cut-and-paste into the city. In the center of it, a large hare as large as my own torso, ears gleaming in the moonlight. He stands still at the very top of the hill, as if he knows I’m watching, as if he’s standing there for me; long enough to let me feel the piercing stab of nostalgia for something I will never know: for the depths of the forest at midnight, for a life of nothing but rain and sunshine, light and darkness. Then he hops back into the trees and out of sight. I find that roots are starting to grow beneath me. They say summer is a bright three-month oasis in dreary white winter. I imagine it now, blurry white replacing the greens and blues, but even in my dreams, the same quietness remains. A forest is a forest, be it warm or cold. Vilnius is a forest – sometimes a forest made of bricks and cement and wood and business, but a forest nonetheless. 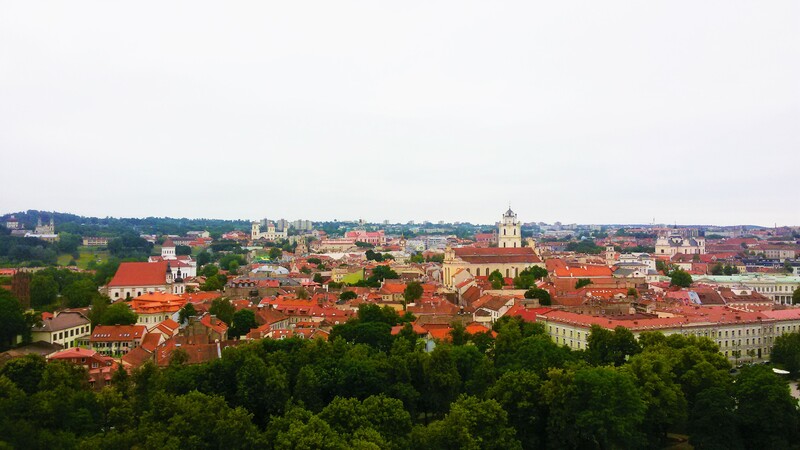 For a tourist, weary of overcrowded postcard-perfect scenery, Vilnius is like finally seeing — it is not a theme park of an ideal; it is the ideal incarnate in reality. Though it is the capital of a country, it lacks the wolfish hunger, the gaping hugeness of a capital. There is no rush, no clamor, no shocking sounds or smells. I emerge from the woods and the trees turn to buildings, the sound of swaying leaves into the hum of trolleybuses, the chirping of forest creatures into the voices of people – but it gives me the impression that if I had my eyes closed, I would not notice the change at all. Just past midnight in August, I wrap a blanket around my shoulders and walk out into the chill air. The trees are quiet, not even whispering, as if they’re being considerate of sleeping people. Overhead, a mass of clouds advances over the stars, lit up in reddish-grey by the city lights. I reach the neighborhood basketball court, a black rectangle between walls of communist architecture, the lights of apartment windows like little LEDs flashing on and off in a smoothly functioning machine. The trees around the court shiver, their branches reaching to hide the lights. In a moment, the buildings will be dark, like hollow logs full of sleeping forest creatures. I lie down in the open air, my back to the asphalt, tucking myself in with my blanket like a child going to bed. The wall of clouds shifts, like the earth is reaching out towards the galaxy. Summer happening in space. I see the first shooting star of the night. My body is rooted to the ground, and when I close my eyes, I hear only the forest around me. Chapter 5 of The Tisroc and the King has been posted. The 2016 Narnia Fic Exchange has begun, so expect more Narnian fics next month. Fall also means that I’ll be starting regular Marius updates. Thanks for reading! Gretchen Mansuri: What a beautiful place and what beautiful descriptive writing. How I long to visit.